Overview: Glide across a mountain top on a thrilling zipline tour through Tortola’s rainforest. See breathtaking island views as you sail across tree tops on this eco-adventure. The thrilling course includes seven traverses and a two-story ladder climb, expertly designed for enjoyment by all family-members, from 5 to 95! Take pictures at strategically-placed photo stops along the course. Afterwards, shop for souvenirs or snacks or relax and enjoy the view. Total tour time: approximately 3 hours. Highlights: Rainforest Eco-Adventure: Zip through and above virgin rainforest canopy and climb a two-story inclined ladder while attached all the way. Exciting Traverses: Walk across cable bridges, climb ladders, cross walkways and fly across ziplines on this amazing tree-top course. 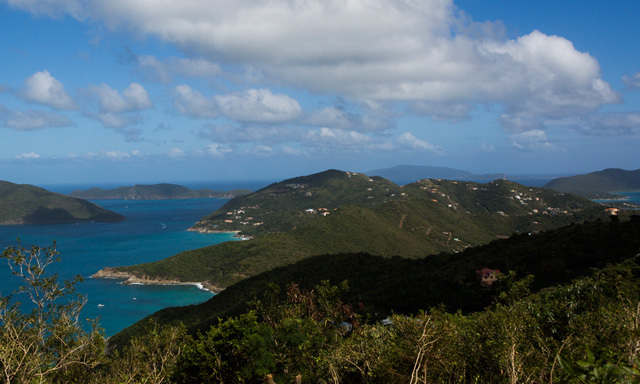 Tortola Vistas: Enjoy a hilltop view of Tortola, Road Town, and surrounding islands as you drive to the base camp. Tagged Canopy Tour, excursion, Tortola.